Paul Williams is a Sydney-based artist whose work blurs the lines between painting, drawing and sculpture. He has a Master of Fine Art from the College of Fine Arts in Sydney, where he won the university medal in 2007. ‘Paul is an amazing artist and one of my closest friends,’ says Marc Etherington. ‘I wanted to capture Paul amongst the creativity, chaos and energy of his welcoming studio interior, which belies the frustration, uncertainty, anxiety and coffee consumption prevalent in his life as an artist,’ says Etherington. 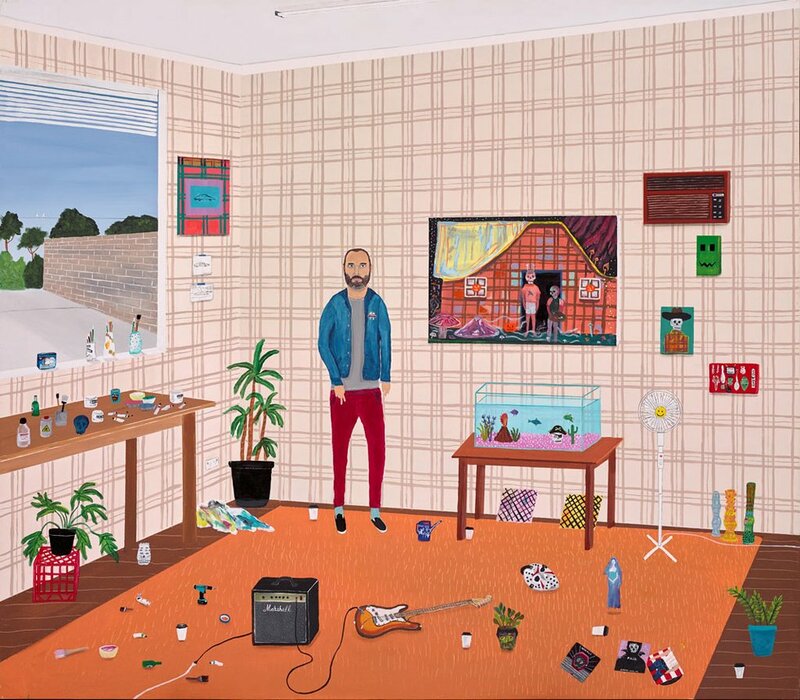 Born in Sydney in 1973, Etherington is a self-taught artist who works out of his garage in the suburb of Gymea making paintings and wooden sculptures that reference his daily life and popular culture. He was a finalist in the 2016 Sulman Prize. This is his third time in the Archibald Prize.